I have spent some time cleaning up The Crossdreamer Portal, our guide to sites and forums of interest to crossdreamers and crossdressers in particular and other trans and queer people in general. Moved blog extracts over to the right hand column for easier access and less clutter. Reduced the number of direct feeds from crossdreamer blogs. Blogs who have not been updated since 2013 have been moved into a "other" list at the bottom of the left column. Reduced the number of links from the crossdreamer forums (Crossdream Life and the crossdreaming reddit). The previous list was a bit too overwhelming. If there are sites you think are missing and should be included, please let me know. Add a comment to this blog post. Visit The Crossdreamer Portal now! Click here for this blog's Code of Conduct! Discuss crossdreamer and transgender issues! The WHO ICD-11 health manual removes transvestic fetishism. Being trans is no longer a mental illness. 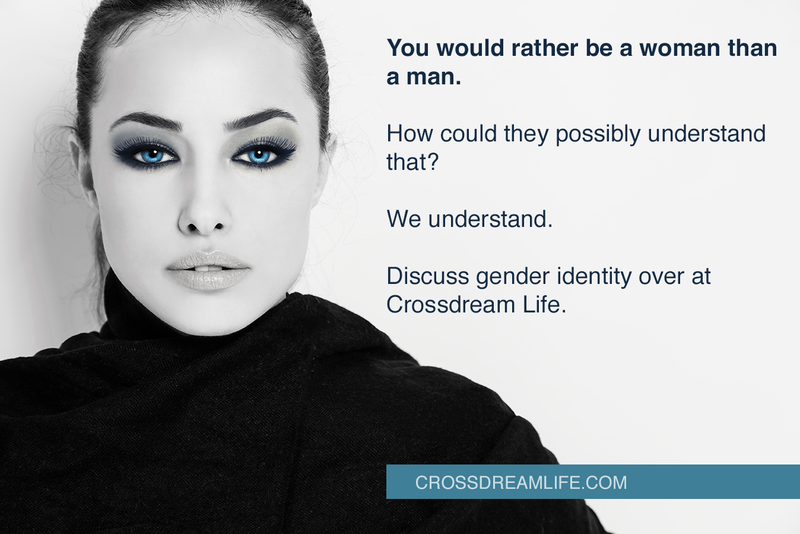 Does the effects of hormones on transgender people prove that crossdreaming has a biological component? The suicide rate among FTM transgender youth is much higher than among MTF teenagers. Why?